LIVE GTS EVENT DRAWING! All 6 Winners Revealed! RE: LIVE GTS EVENT DRAWING! 1st & 2nd Winners Revealed! 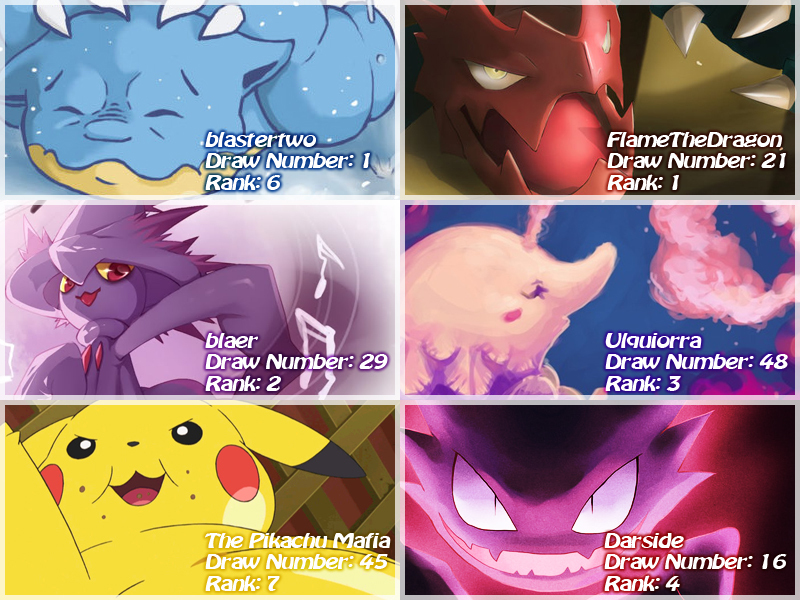 FlameTheDragon drew on #21 after blastertwo! Ulquiorra wins as well with #48! All the winners are now up. Winners, please fill out these forms, scan, and have it sent to me by November 4th - that is the deadline. If you require a few days extension, you must speak to me and arrange it first. Otherwise, a new winner will be declared in your place. Battles are done on PO, the best results will pick first. The first to report the results will also win tie-breaking results. RE: LIVE GTS EVENT DRAWING! All 6 Winners Revealed! Congrats everyone!! Sad I missed the suspense, but oh well. Work is the worst. Thanks to Darside for my adorable signature! (13:52:58) Team Plasma N: (10:52:44) Team Plasma N: Iceninja's a girl? It is awful, lol but I have time until I end up working as much as u.
I forgot the email to send the form to. I scanned it already. Can someone tell me the email again? Please don’t forget to complete your battles and the winner forms! I probably wont be able to do my battles until the weekend sadly. What!? Darside's suppose to lose! 3) Ulquiorra wins battle 1 against Blaer! 5) Ulquiorra wins battle 2 against Blaer!